Realty World Wichita announces the first Mobile Real Estate App in the area for multiple platforms. 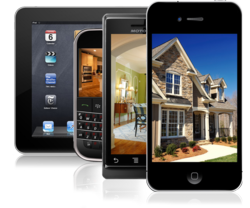 Use your iOS, Android, BlackBerry, or Windows Mobile phone to search for homes. Realty World Wichita released the first mobile search app in iOS, Android, BlackBerry, or Windows Mobile app stores for consumers home search in Wichita, KS. Realty World Wichita leads the South Central Kansas real estate market with consumer based technology. Already having mobile websites for clients, the free mobile app uses GPS technology to locate homes. Consumers can visit their platform app store or market place, and search for “Wichita Real Estate” to find the Realty World Wichita app. Once installed, this robust app integrates Maps, Driving directions, pictures, and more to assist with a home search. Search for houses by location only, or narrow the results with price, bedroom, and more. "Searching for homes is a mobile activity," says broker/owner Greg Fox, "No matter what you see on a computer screen, people still visit the homes. This mobile app allows you to tour a neighborhood and search for houses." This is the first true Real Estate App released in South Central Kansas. The program fully integrates Smartphone or Pad technology, vs. a Thin App design that utilizes the device browser for data. This integration allows GPS and other features to function seamlessly for the consumer. Smartphone sales in North America accounted for more than 50% of all cellular sales in the last 6 months. As this market continues to grow, the need for technology that allows consumer to have mobile access to Real Estate will become a consumer demand. Traditional websites don’t work well with most Smartphone’s because they aren’t optimized for mobile browsers or they can’t utilize many tools such as maps or GPS. Realty World Mobile app integrates sold homes as well. Data available from a variety of public sites is compiled by OnBoard Informatics and made available to consumers through this app. The recently sold home data helps the consumer compare home prices listed versus sold data to understand relative value. This app has data from the South Central Kansas MLS, including the Wichita, KS metro area, and surrounding cities - Andover, Rosehill, Mulvane, Derby, Haysville, Goddard, Clearwater, Cheney, Maize, Park City, Sedgwick, Newton, Kechi, Augusta, Bel Aire and more. Those interested in knowing more can visit http://www.GPSWichita.com, http://www.RealtyWorldWichita.com, or call Greg Fox at 316-688-0077.